B. Stevens, The Collector's Book of Snuff Bottles, New York, 1976, pp. 164-5, no. 598. 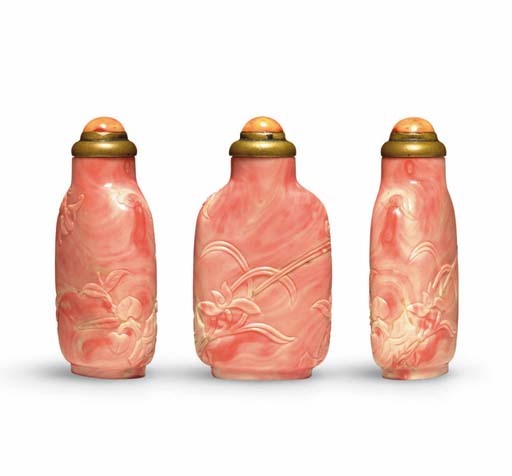 H. Moss, Chinese Snuff Bottles No. 4, p. 36, fig. B.
Coral is a symbol of longevity, due to its resemblance to a tree that seems to last forever. It was also a symbol of the first rank as civil officers of the first rank wore coral buttons on their hats. Coral was highly valued at Court and was considered to be the third most valuable gem. In Catalogue of the Exhibition of Ching Dynasty Costume Accessories, p. 31, the order of value is given as pearl, ruby, coral, sapphire, lapis lazuli, quartz, shell etc. Coral was also the material used for the Emperor's Court necklace when worshipping at the Altar of the Sun, matched by a coral belt. Coral snuff bottles were produced for the Court throughout the early to mid-Qing period, and apart from the Palace workshops, we are told in Masterpieces of Snuff Bottles in the Palace Museum, p. 29, that the records reveal that snuff bottles made of gems and gemstones (which included coral) were mostly produced at Imperial lapidary workshops in Suzhou and Yangzhou by order of the Emperor. The form here would also endorse an Imperial product, since this rounded-rectangular form was a Court staple during the mid-Qing period. The rarity of genuine early and mid-Qing coral snuff bottles is presumably due to the fact that only the occasional branch was large enough to make a snuff bottle. Several of the earliest known coral bottles were made in segments joined together, or when made from flawed material (which was all that was available), requiring either patches of coral inlaid to fill flaws, or wax inlays. In the present bottle, one of the leaves has been originally filled with a fillet of matching coral. One of the most famous of all early coral snuff bottles also has two flaws filled with fillets of additional, matching coral material (see Moss, Graham, Tsang, A Treasury of Chinese Snuff Bottles, Vol. 3, Stones Other than Jade and Quartz, no. 435). For the symbolism of the bat and peaches, see lot 637, and for the orchid, lot 658.